1. 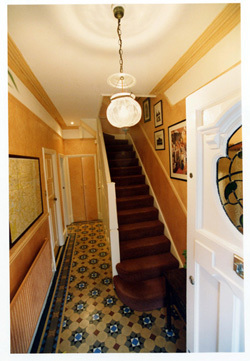 View of hallway and stairs leading to Belinda’s consulting room. 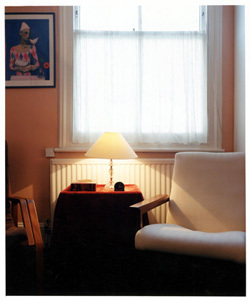 The consulting room is situated in her home. 2. Consulting room view. Belinda’s view looking straight ahead at clients’ chairs. "I like to get into a state of mind where the unconscious aspects of the relationship are predominant and can be worked with. The 'real life' relationship with the patient - where we have to manage comings and goings to the session and money matters etc. has a negligible place in comparison." "I'm an experience for the patient(s) - rather than a woman of my age sitting in the chair. I can be anything to them whatever it is they would find it useful to see me as."